City Opera House is privileged to have the support of a committed group of business sponsors. These partnerships help City Opera House to continue to bring first-class entertainment and arts education programming to the heart of the region. Why should you sponsor City Opera House? Connect Your Business. Choose from three levels of sponsorship and build a relationship with City Opera House patrons. In appreciation for your sponsorship support, we provide maximum visibility for your business. City Opera House is Unique. Your brand will be front and center during the arts performance series season (September to May) when most households are making buying decisions. What makes City Opera House different? We present high quality cultural experiences in the population and business center of the Grand Traverse Region, right on Front Street. Sustain a Traverse City Treasure. City Opera House is a non-profit organization devoted to presenting national touring acts from around the world. Your sponsorship helps inspire the community’s passion for the arts and highlights your commitment to enhancing the quality of life in the northern Michigan community. To learn more, call (231) 941-8082 ext. 207. 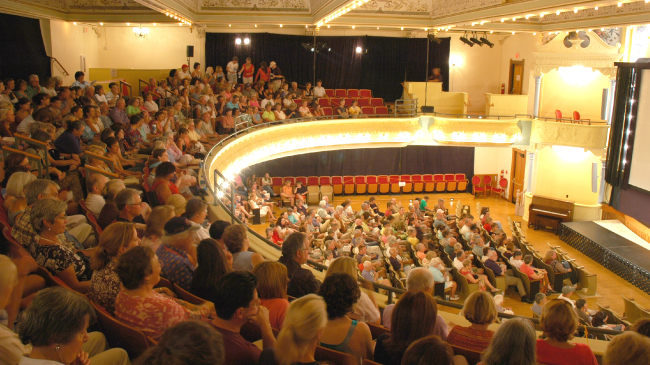 City Opera House plays an important role in the expanding cultural climate of Traverse City and downtown in particular.